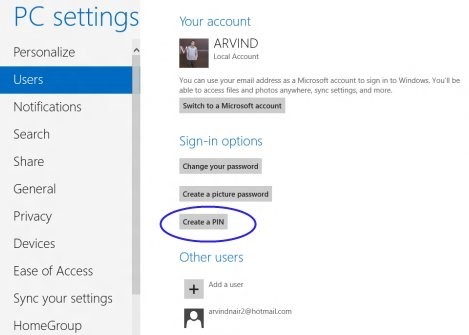 Here is a quick tutorial on how to login Windows 8 using a Pin instead of a password. To login Windows 8 through a PIN instead of a password is one of the great exciting feature in Windows 8. I found this feature very much similar to that four digit Debit/ATM card PIN code. We, rather feel in certain situations where it becomes difficult to always access with Windows live id. In case, you are updating your Windows, if the screen gets locked as you open and login to screen by pressing enter, it sometimes fails to complete the procedure. This procedure to login using a PIN instead of a password works for quick login and for single users. Lets move on and check out How to enable PIN instead of a password ? Also, check out our post on Must Windows 8 tutorials. First of all, launch the charms bar, by pressing Window key+C. Now, select the option “More Settings” to explore “PC Settings”. After exploring “PC Settings”, click on “Users” option and select “Create PIN”. Now, enter your current password and click on “OK”. Enter a four digit confidential PIN and then reconfirm the PIN again. Click on “Finish”, to get your PIN configured. Whenever the Next time, you login to lock screen, just need to enter your four digit confidential PIN and you don’t need to press “enter” to login with your account. All you need to do is just only enter the PIN, you are logged into it. Really, this an amazing feature in Windows 8.